Our shop not only sending flowers, new born baby hamper also do. 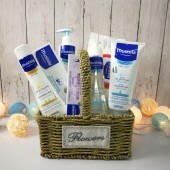 We have couple of baby hampers provided which has flower bouquet include cloths, socks, hat, bib and bodysuits; Mustela hamper include baby shampoo, wipes, eye cleanser, cleaning milk, cream, toys etc. 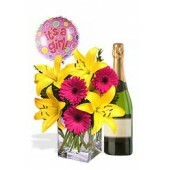 ; and flower arrangement with balloon or wine. Send the hamper that you like and share the happiness of congratulation for the new born baby to your families or friends. New Born Baby Hamper for Baby Boy, Including Mustela Baby Eyes Cleaner , Mustela Cleansing Milk, Mus..
Asiatic and Gerbera Package White Wine and balloon ..
Mixed bouquet package , Medium teddy Bear and Balloon ..
New Born Baby Hamper for Baby Boy, The Best Gift for a new born baby ..
Mustela Hamper for New Born Baby, Including a Lovely Forever Friends Teddy Bear, Mustela PhysiObebe,.. Forever Friend's Baby Hamper for New Born Baby Boy ..
Congratulations Flowers arrangement for New Born Baby, 6 Red Roses, 6 Red Carnation, 12 Yellow Roses..